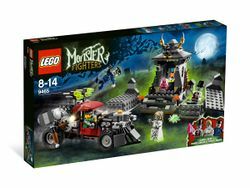 9465 The Zombies is a Monster Fighters set released in August 2012. It contains 447 pieces, including with two graves, four minifigures, Jack McHammer's car, a pavillion, and a glow in the dark spider piece. This set includes two exclusive minifigures, Zombie Bride and Zombie Groom and one other Monster, Zombie Driver. Jack McHammer, the Monster Fighter, appears with a heavily modified truck which consists mainly of red and grey pieces and a hammer. The set also includes a cemetery scene with two coffins, and a small crypt. The car is mainly red and grey pieces with two head lights, a shielded front of the car, a giant hammer on the right side, and four green flick missiles. The car has a feature where it's hammer can slam. The car has bigger wheels in the back and smaller in the front, a style of which is used in many Monster Fighters sets. The crypt is composed of mainly darker grey pieces. It has the Zombie Moonstone on the ground in front of a cauldron. Behind the cauldron are some blue and gold pieces. There is a torch on either side of the moonstone. When the moonstone is turned, the grey coffin lids open disclosing the zombies. The story of the set is Jack McHammer spots the graveyard, and then sees the zombies popping out of the coffins. The Zombies is often referred to in Monster Fighters videos as "The Graveyard", and home to the coffins of the Zombie Groom and Zombie Bride (who cannot fit inside either coffin due to her larger leg "dress" piece). The set was going to include a Voodoo Doctor, but was changed to the Zombie Bride and Groom. It includes a glow in the dark spider. It was retired in December, 2012 after five months of availability. This is a description taken from LEGO.com. Please do not modify it. (visit this item's product page) Help Jack McHammer get out of grave danger and seize the zombie moonstone! Facts about "9465 The Zombies"